Memer Paradise: Modelling aint that easy! I now know why I am going to be a teacher instead of a model. And to those of you who are still aspiring to be a model, I am not saying you can't. Yes, you can and modelling probably suits you alright. But it surely is not my thing. I simply cannot be a model! It's difficult, I tell you. How would I know? Did I just model for CK or Emporio Armani? That's just too ambitious. 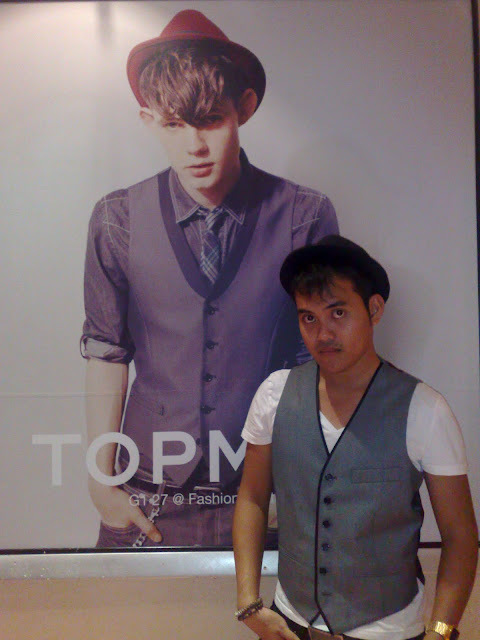 TOPMAN perhaps? What exactly went down was, on the very last Sunday I was in college, my friends and I went out for some outing. We went to Istana Garden which I was dying to go and man, it was beautiful there. What happened was they decided to have sorta a little photo shoot and I happened to be one of the models. It was really embarrassing because there were loads of people there. But I had to toughen myself up, thinking that "This is how a real model works, so I'm gonna do it like how it's done." Hahaha. My two other friends were like professional models, striking their poses and I was like this little tiny "I'm so shy but I wanna be a model" model. Hahaha. And Mr. Cameraman kept commenting that my face was emotionless that I kept giving the same expression in almost all pictures he snapped! That was awful! Argh! From that moment, I know I am not model material and America's Next Top Model ain't no easy as I thought it was! And to all model wannabes, I wish you all the best. You guys must indeed have some abso-fabu-lutely awesome skills in modelling! All the best! Oh yeah, before I forget, I am FAT! A future teacher who happens to enjoy so much of his life. Loving life to the fullest and trying hard making it the best he can have. WARNING : You're entering Cin City ! Nervous About Your Big Day? Here’s What You Can Do! Copyright © Memer Paradise. All rights reserved.